You all know the feeling. The kind when you are so connected to your music that everything else fades away. That feeling takes you to another place, another world. Sometimes, it reminds of us our best days, our greatest joys. Other times, it simply allows us to let go for a while, to get away from the noise and stress of life. It can help us focus on a certain task or thought. 2. What Does This Product do? It gives us a sensation we are never quite ready to give up. You also know the feeling when that connection is lost. An arguing couple walks by at the coffee shop. A kid starts screaming in the plane seat behind you. The guy sitting nearest to you at the library is chewing gum loudly. You lose your focus, your memories fly away, and reality sets back in. But what if there was something out there that would make all the other noise of life be as silent as you want them to for as long as you want? There is. They are called noise cancellation headphones, and the best are made by Bose. In this article, we will rate some of the best Bose noise cancelling headphones on the market. Bose offers several choices of noise cancelling headphones. All the best Bose's noise cancelling headphones are made with their Acoustic Noise Cancelling technology. To quote Bose themselves, "It continuously measures, compares and reacts to outside noise, then cancels it with the opposite signal." You can make the headphones do all this with just the click of a button. With some models, you can even adjust the amount of noise cancelling, letting you hear what you want to hear. Models are also available with Google Assistant and are soon to be compatible with Alexa. So now you can answer your phone, hear messages, texts and answer all with the sound of your voice. Some are Bluetooth compatible and, therefore, can be wireless for hours of uninterrupted music or any entertainment of your choice. These are headphones that allow you to listen to music, movies and audio books all while blocking out any ambient noises around you. These headphones cancel the outside noise around you so you can better hear whatever is being played through your headphones. Each pair of headphones has several sets of microphones that listen to the noise going on near your person. It is constantly listening. As it listens, it calculates and then applies just the right equal and opposite signals to cancel that noise out. After researching all the best Bose noise cancelling headphones, we have come up with a list of what we think are the best ones based on their sound quality. As we studied what Bose themselves had to say about each set of headphones and then what clients who had used them had to say we discovered some simple truths. Bose is a company that is constantly trying to make a better product, better than the last one. And people expect that. They expect the quality and efficiency of the products they are looking at for getting better and better. They expect bugs to be fixed and problems that came about in the last model to have been made obsolete. Bose understands more than most. As we looked at each set of the best Bose noise cancelling headphones, we saw their constant efforts to make their products better exactly what customers are looking for. The following products were reviewed based on the following parameters: features, pros and cons, price, where to buy, and warranty. These headphones bought new from the manufacturer range from $500.00 for the pricier models to $250.00 for the least expensive ones. There are a few options the higher priced models have that the ones found for less does not offer, such as compatibility with Google Assistant and being able to customize colors, patterns, and design of your specific headphones. 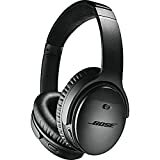 The best Bose noise cancelling headphones can be found at most major retailers with an electronics department and online through several sites such as Amazon and eBay. Fortunately, for those who are auction site savvy, there is always a steal or two to be had. 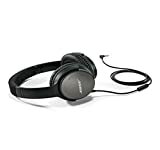 These are top of the line when it comes to the best Bose noise cancelling headphones. They are wireless, so they are Bluetooth compatible, having a battery life of around 20 hours. However, should your battery start to wane, just 15 minutes of charging will produce additional 2.5 hours of listening pleasure. The first of its kind, Google Assistant is now available so you can talk on the phone, hear messages, texts, and all of your answers with a simple click of a button on the left ear cuff. Incorporated with glass-filled nylon and corrosion resistant stainless steel, the QC35 headphones are built to handle whatever you need them to. They are also built for comfort with Alcantara, the same material used on yachts and expensive automobiles, for all day luxury that feels light as air. 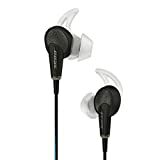 Most reviews mention that these are the most comfortable headphones they have worn and are much lighter than many headphones found in the same category made by other companies. The battery is not replaceable, so it comes with a charging cord. This product can be found in stores and online for around $340 - $360. Bose offers a 30-day money-back guarantee on all of their products if you are not satisfied with your purchase. As we go down in price a bit, we also see a major size difference between these. The QC30 headphones are made of a completely different design than their more expensive counterparts. They are designed to work with a neckband that rests comfortably for all-day wear and earbuds attached with small wires to reach your ears comfortably. The tips are designed to fit into your ears better and create a gentle seal for added noise cancellation. They are also designed with a special extra wing for more stability. This makes keeping them in your ears by readjusting them every so often a thing of the past. Microphones on this pair of headphones are in the neckband allowing for excellent measuring of outside noises near you. They are wireless and have Bluetooth capabilities, with an inline remote to take/end calls or skip and pause songs, as well as a volume control button. This product can be found in stores and online for around $290 - $310. 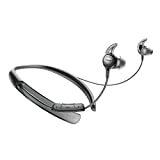 Bose offers a 30-day money-back guarantee on all of their products if you are not satisfied with your purchase. However, since these are no longer in production, the guarantee is now null and void on them. These are no longer in production. They have been replaced by the QC35 wireless model. They have the same headband style design and are essentially made with the same materials. However, they do not contain Bluetooth compatibility and are, therefore, not wireless. And they certainly don't have Google Assistant either. This model was created to replace the QC15 headphones. And they were an improvement with many reports of better sound quality and better noise cancelation capabilities. The cord had an inline microphone/remote for easy call making and volume control. They could also fold making storage easier. They were comfortable to wear for long periods of time. Bose does still offer accessories for this model, such as new cords, ear cushions, and a carry case. This product can be found in stores and online for around $170 - $190. Bose offers a 30-day money-back guarantee on all of their products if you are not satisfied with your purchase. However, since these are no longer in production and they can not be bought from Bose, they also no longer offer this guarantee. These are the most affordable pair of headphones that Bose offers that have noise cancelation capabilities. They are in-ear headphones that provide a soft, secure fit to just about any ear. While they do not offer different levels of noise cancelation like the QC35 and QC30 headphones, they give you the option to disable the noise cancelling feature, allowing you to hear ambient noise. There are two of these models. Since they are not wireless and, therefore, must plug into something there is an Apple version and an android one. The inline microphone allows you to take calls and control your volume and music with ease and gives you access to voice recognition apps like Siri and Google search. This product can be found in stores and online for around $180 - $200. After extensive research and looking at lots of different reviews for what we have labeled as the best Bose noise cancelling headphones, it comes down to two choices for the most recommended one. The QuietComfort 35 wireless headphones are a fan favorite to be sure. With Bluetooth and Google Assistant, it ranks way up there for those of us that really love our technology. And while the QC30 has much of the same capabilities, for the price, you might as well spend another $50 and get the Google Assistant along with it. The long battery life and optional charging cable also make it one to love. Based on its sound quality all reviews found have rated it as having better quality overall than its predecessors. The sound of the music is more clear and balanced, and the noise cancellation is more complete. Most people were amazed at what they could not hear of the ambient noises around them while wearing these. For those that are not so in love with the "extras" and may not use them as much, we suggest the QC20 noise cancelling headphones. These are more like your basic earbuds, but they still cancel out all that extra noise you don't want to hear. With the option to turn off the noise cancellation and connect with voice recognition apps, this pair of headphones is the best option for those looking for simple noise cancelling headphones. So depending on you what your preference for technology is will depend on which pair of best Bose noise cancelling headphones you choose for yourself and your needs. Take a look for yourself and see what you think.